WSS strongly condemns the brutal police action against the students of the University of Hyderabad. The students, who were exercising their democratic right to protest, were lathi-charged, beaten and manhandled and women students were mauled and threatened with sexual assault. Students and faculty members were forcibly dragged into police vans, thrashed and moved from thana to thana to prevent them from contacting their lawyers and families. They have also been mercilessly beaten while in custody. As many as 34 students and three faculty members have been sent to jail – the beatings have continued even after remand. 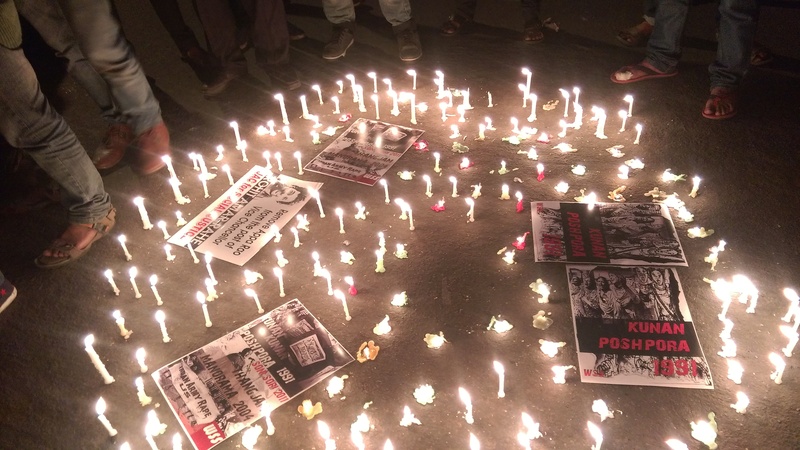 About 300 people – WSS activists, women activists from the National Union of Forest Working People, students from the march for Rohith Vemula – gathered at Jantar Mantar in Delhi on the evening of 23 February for a candlelight vigil to mark Kashmiri Women’s Resistance Day. This is the anniversary of the gang rapes of 25 women in Kunan Poshpora village of Kashmir, by soldiers of the Fourth Raj Rifles. The vigil was an expression of solidarity with the thousands of women in Kashmir, Manipur, Chhattisgarh and other parts of the country who are being subjected to sexual violence by the army and security forces. Protesters sang songs of struggle and resistance, and reaffirmed their commitment to standing with women in exposing and opposing state violence.